It was August 11, 1965 when Ford’s Donald N. Frey, Vice President and General Manager, released the news that a new vehicle was to appear in dealer showrooms across the nation in early September. According to Frey, “This new vehicle, the Bronco, was created to be the combination of both a car and truck for men and women who seek adventure as well as practical transportation.” The Bronco can serve as a family sedan, sports roadster, snowplow or farm and civil defense vehicle. It has been designed to go nearly anywhere and do nearly anything. Three versions in the Bronco line up include the roadster, the sports utility and the wagon. This is my interpretation of the history of the standard bronco known as the “Roadster” and its three years of production. The Roadster’s vehicle identification number always began with the proud “U13” representing the vehicle “Series” followed by a sequence of letters and numbers declaring the production month and year. 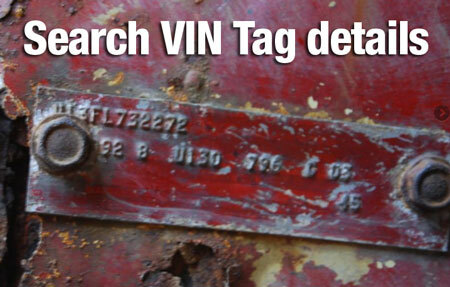 The Roadster was further identified on the VIN tag as body type code “96”. The 1966 Bronco Roadster is very unique vehicle in its own. The standard basic version was an all-purpose vehicle without a top or doors. Standard for all Early ’66 Broncos was the 170 cubic inch 105 hp six cylinder engine. In mid-March Ford provided the optional 289 cubic inch 200 hp V-8 motor. A three-speed column shift transmission and Dana 20 transfer case were standard as well. A ball style transfer case shifter was initially used but replaced mid-year with the T-handle lever to deal with complaints the customers often confused it for a typical transmission shifter and to also help prevent four-wheel drive “jump out”. The door openings on a Roadster were usually filled with a fiberglass inserts as standard equipment giving that classic contoured sporty Roadster appearance. Dealer installed vinyl doors and a convertible top, available in black or white, were available. Hard doors were available as well with or without glass and frame, thus eliminating the inserts. Another interesting option of the Ford Bronco was the ability to lay the windshield flat on the hood. In this position it would be secured in place by the loop catch on the hood and the windshield mounted spring-loaded pin. This held the windshield firmly in place in rough terrain allowing for a true open-air drive! Vacuum wipers were standard issue on all Bronco models. Standard was a driver’s side, single stemmed, “Outside Rear View Mirror” that was round and mounted to the fender. A factory installed passenger side view mirror was an option as well. Square end painted bumpers protected the frame at both ends. Chromed bumpers with matching taillight bezels were also an option. 15″ bright metal wheel covers with the inclusive three black rings could be added from the factory to give the tires and rims that pristine appearance. The standard seat was a bench type with room for three persons and a steel bulkhead mounted directly behind, sectioning off the rear bed. An optional seating arrangement included front buckets (Left Hand or LH & RH) with the steel bulkhead. and no backseat. Also optioned was a rear seat (bench type with seat belts) that when ordered, eliminated the bulkhead for full rearward access and relocated the spare tire to the inside of the tailgate. Very unique to the 1966 Bronco was the silver-gray vinyl upholstery and matching optional sun visors were available. Sturdy black seat belts came as standard equipment. The gray dash of the Broncos varied depending on the options that were ordered. A factory or dealer installed AM radio and antenna was optional and many Roadsters had an external speaker grill cover to protect the speaker cone from the weather. Some Broncos were ordered with the option added cigar-cigarette lighter and the ICC emergency lamp flashers. A black, narrow line, vinyl dash pad (a.k.a. pencil dash) and optional chrome pull handle gave the Bronco dash that finished appearance. No optioned dashes are commonly referred as “deletes.” It is not uncommon to hear a Roadster owner reference heater, radio, lighter or flasher delete dashes. Forward mounted rear shock absorbers were classic for the 1966 Broncos including the Roadster. Optional: Bronco body paint stripe and rocker panel or accent racing stripes. As Ford grew deeper into production, the 1967 Roadster introduced a few cosmetic changes. Both motors, the standard three-speed transmission and two-speed thru-drive transfer case all remained unchanged. The body of the Roadster remained the same. The taillight lenses were still one solid color, red, and no side body markers. Chrome headlight bezels were added to compliment the optioned chrome bumpers. Bright wheel covers were replaced with the shared 15″ caps found on Ford’s other vehicles such as the Galaxie and pickup. These caps remained unchanged on the Bronco throughout the duration of their production. All seating options remained the same and parchment colored vinyl became the standard for seats and sun visors. The dash options remained the same. However, Ford decided to replace the long and frequently difficult pull knobs of the ’66 to more convenient flattened control knobs. Centers of the knobs became chromed, replacing the ivory centers, and the dash was painted neutral to match the parchment vinyl. The rear shock absorbers were repositioned to a rearward mount and remained that way throughout the life of the early broncos. Obvious changes appeared for the Roadster in 1968. Fitted with dry air cleaners, the 170 and 289 cu. in. motors remained the hearts of the roadsters. Gone were the oil bath air cleaners found on the ’66s and ’67s. Eventually, the 289 cu. in. motor lost its foothold and was replaced, after 1968, by the 302. 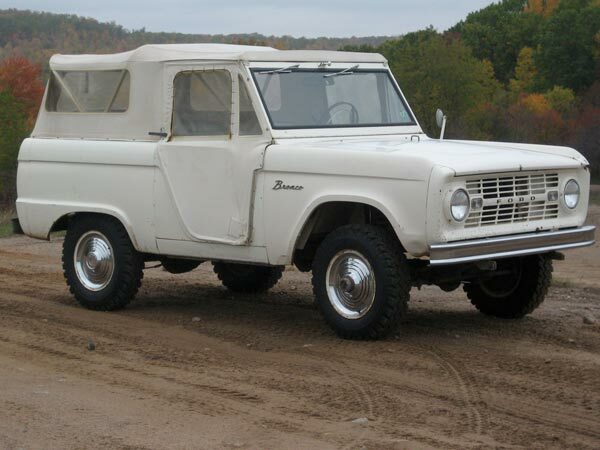 1968 meant the introduction of the “Ford Motor Company Lifeguard Design Bronco Safety Features” program. The Roadster, as with all vehicle production, had to follow the evolution of guidelines implemented by the U.S. Department of Transportation. The dual hydraulic brake system with a warning light and 4-way emergency flashers became standard, rather than just an option. Glare reduced windshield wiper arms with washer “hood squirters” and a satin finished horn button became standard features also. A new and improved energy-absorbing pad, safety-designed control knobs and a taller rectangular speaker grill, were all improvements made in the dash. Padded safety sun visors, an inside yield-away (day/night mirror), windshield-mounted rearview mirror and double thick laminate windshield glass were included as well. Some say the vacuum wipers at this time could have been “optioned out” for a newer dependable 2-speed electric setup. An obvious change to the Roadster body was the addition of side body reflectors. Grill and taillight reflectors could be installed as factory upgrades as well. Gone were the solid red taillight lenses of the ’66 and ’67 Roadsters while the integrated new backup lights became standard production. The grill’s petite clear turn signal lenses vanished after 1968 when they were replaced with the oversized orange lenses. In result of added safety features, the fun and foldable windshield, the familiar hood loop and windshield latch were last installed in 1968. This meant the large chrome interior windshield to dash knobs went as well and were replaced with inconvenient bolts. The bumpers were replaced with curved ends. In order to yield a much larger view of what was behind, a large, rectangular, “Outside Rear View Mirror” replaced the smaller round mirror that could have restricted the driver’s view. Unfortunately, popularity and sales were so low in 1968 that Ford discontinued the Roadster for production year 1969. The Bronco lineup continued for the next eight years without the roadster and eventually ended in 1977, the final production year for the first generation Bronco. Only 5,000 Roadsters were produced out of a total 225,585 early model Broncos.